Holistic nutrition focuses on a natural approach to a healthy diet and considers the individual as a whole, including all aspects of his lifestyle, according to holisticnutrition.com. This natural approach incorporates emotional, spiritual and physical health to create a state of well-being for optimum health. A holistic approach to proper nutrition encourages education on basic nutrition to develop a holistic diet that incorporates natural and organic foods, natural holistic supplements and food treatments for chronic health conditions. According to holisticnutrition.com, the fundamental principle of holistic nutrition is that food provides the energy needed to function properly and supplies the nutrients that are required to build and regenerate bone, muscle, fat and blood. The nutrients obtained from food are essential for the natural processes that constantly take place inside the body. Holistic nutrition involves three main components: macronutrients, which include carbohydrates, protein and fats; micronutrients, which include vitamins and minerals; and fiber. These components all play an important role in how the body functions and are essential to a complete, balanced diet. Holistic practitioners--including acupuncturists, chiropractors, herbalists and nutritionists--agree that following a diet under the guidelines of holistic nutrition allows people to heal naturally without the use of prescription drugs, according to e-ssortment.com. Holistic nutrition requires a proper balance of protein, vitamins and other nutrients for optimum health to reach optimum energy levels, emotional well-being and the ability to fight infections. Following the guidelines of proper holistic nutrition can help prevent various health problems such as heart disease, diabetes, obesity and cancer. People who are seeing a health care provider for any of these conditions should ask their provider what is right for them before beginning a holistic diet. The most important component of holistic nutrition is incorporating natural foods into your diet whenever possible, according to holisticmed.com. Foods such as vegetables, whole grains, fish, beans, fruits, nuts and seeds are the basics of a natural food diet. When cooking these foods, you can use herbs, spices, sea salt, tamari, unrefined sesame oil, virgin olive oil and natural sweeteners for flavor. 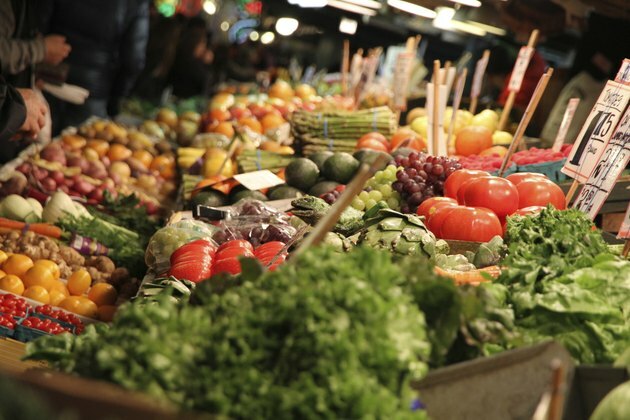 It is best to use fresh fruits, vegetables and other ingredients from local farmers' markets or produce stands that sell certified organic produce. It is also important to eat a variety of foods within each food group, especially leafy green vegetables. It is important not only to nourish your body with plenty of fluids, but also to consume the "right" types of fluids, according to holisticmed.com. Herbal teas are a good substitute for other caffeinated drinks such as coffee and soda, and you have a number of choices when it comes to tea variety. It is best, however, to avoid herbal teas with high caffeine content, such as guarana, kola, nut and black tea. Drinks such as plain spring water, soy milk, rice milk and fresh juice are healthy alternatives. If you buy juice from the store, be sure to purchase juice that is organic and uses filtered water. Additional options include amasake, a beverage made from rice and is naturally sweetened with almonds, and vegetable broth, which nourishes the body with vitamins and minerals. According to website Life Positive, following a holistic nutrition plan has powerful psychological, spiritual and overall health benefits, especially for people who suffer from chronic conditions such as diabetes, heart disease, cancer, asthma and tumor growths. A holistic diet strengthens the bones, blood, muscles and vital organs, including the heart, liver, stomach and intestines. Holistic nutrition also follows the belief that physical ailments are directly related to psychological well-being, so developing a healthy and balanced diet helps to relieve stress, memory loss and other mental conditions. Holistic nutrition is designed to heal the body, enrich the mind and cleanse the soul to reach the ultimate healthy lifestyle.